IL TRASFERIMENTO DAL PORTO DI FAVIGNANA FINO ALL’ALBERGO BOUGANVILLE. IL COSTO DALL’AEROPORTO DI PALERMO E’ DI €. 49,00 A PERSONA, MENTRE DALL’AEROPORTO DI TRAPANI E’ DI €. 33,00. PER I SERVIZI DI RIENTRO CON PARTENZA DA FAVIGNANA IL COSTO E’ IDENTICO. 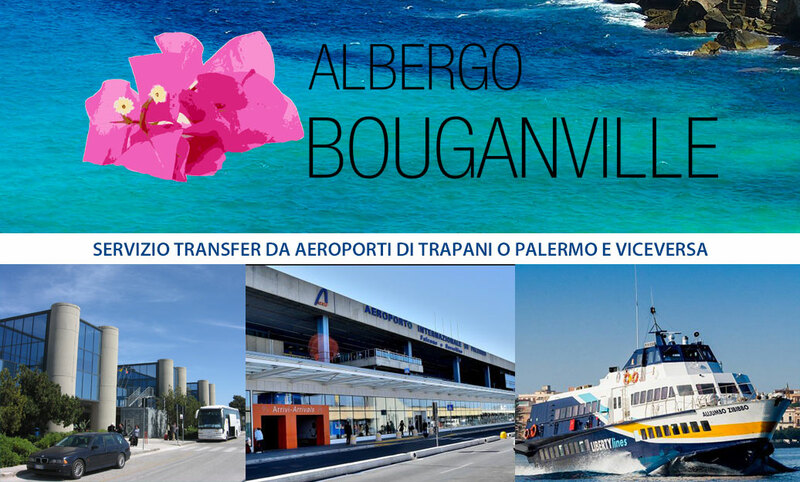 TRANSFER FROM THE PORT OF FAVIGNANA TO THE HOTEL BOUGANVILLE. THE PRICE FROM PALERMO AIRPORT IS €. 49.00 PER PERSON, WHILE FROM TRAPANI AIRPORT IS €. 33.00. FOR RETURN SERVICES STARTING FROM FAVIGNANA THE COST IS THE SAME.